Practice Concrete Technology questions and answers for interviews, campus placements, online tests, aptitude tests, quizzes and competitive exams. This set of Concrete Technology Multiple Choice Questions & Answers (MCQs) focuses on ” Thermal Properties”. 1. How many principal thermal properties are there for aggregates? Explanation: There are 3 principal thermal properties for aggregates: coefficient of thermal expansion, specific heat, thermal conductivity. 2. Coefficient of thermal expansion of concrete is ___ coefficient of thermal expansion in aggregates. Explanation: Coefficient of thermal expansion of concrete increases with the increase in coefficient of thermal expansion of aggregates and vice-versa. 3. If the coefficient of thermal expansion of coarse aggregates and cement paste differs too much, then what happen? Explanation: If it happens then a large change in temperature may introduce differential movement which may break the bond between the aggregates and the paste. Explanation: If the coefficient of the two materials differ by more than 5.4 * 10-6 per oC, then the Durability of concrete subjected to freezing and thawing may be affected. Explanation: The coefficient of thermal expansion lies between approximately 5.4 * 10-6 and 12.6 * 10-6 per oC. Explanation: The coefficient of thermal expansion for hydrated Portland cement lies between approximately 10.8 * 10-6 and 16.2 * 10-6 per oC. Explanation: The linear thermal coefficient of expansion lies between approximately 5.8 * 10-6 and 14 * 10-6 per oC depending upon the type of aggregates. Explanation: The specific heat of the aggregates is a measure of its heat capacity and thermal conductivity is to conduct the heat. Explanation: Thermal conductivity is the ability of the aggregates to conduct the heat. 10. ”The coefficient of thermal expansion affects the heat resistance”. Is this statement true or false? Explanation: Coefficient of thermal expansion and fire resistance both are related to the heat content. Sanfoundry Global Education & Learning Series – Concrete Technology. 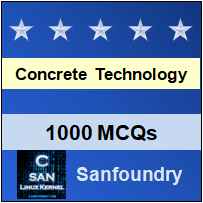 To practice all areas of Concrete Technology, here is complete set of 1000+ Multiple Choice Questions and Answers.